The surfer. The artist. The Boy Scout. The nature lover. The self-described “girly girl.” These aren’t stereotypical characters stenciled into a new reality TV show. They’re some of the fascinating—and fantastic—high school students who were a part of this summer’s Restoration Youth Crew (RYC). Facilitated by the Conservancy’s Park Stewardship program, RYC gives a diverse group of Bay Area youth an intensive six-week crash course in ecology, restoration, and land management. What does that mean in practice? We sent a reporter and photographer to find out, by tagging along with the team on a warm day in June. 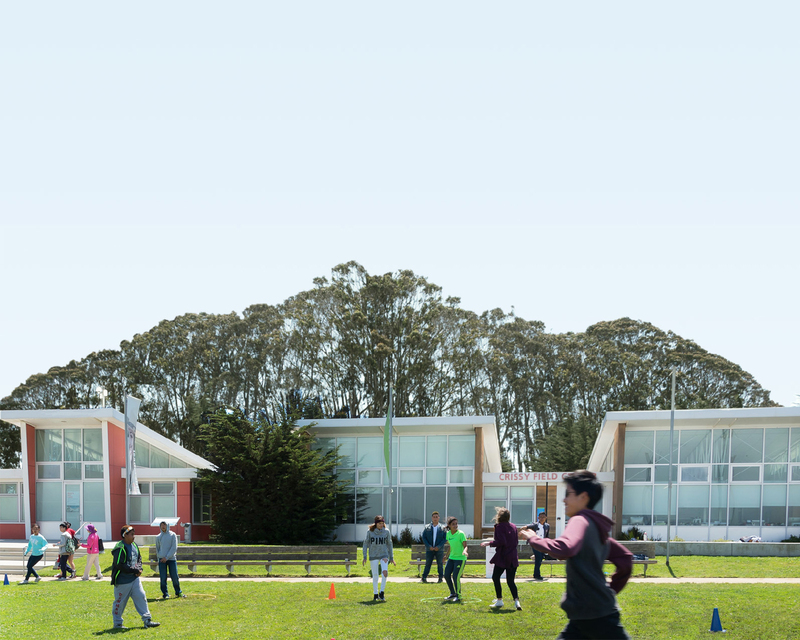 For details on the Park Stewardship youth programs—RYC, LINC (Linking Individuals with their Natural Community), Advanced Internships—as well as Crissy Field Center environmental leadership programs, visit Youth Leadership Programs. In addition to the obvious ecological lessons, RYC offers a real-world way to develop leadership skills and strong workplace habits. It permeates the program: the whiteboard in front of the room lists the two crew members who are “captains” for each work day, and even the backpacking trip to Big Basin State Park—which kicked off the program—had been an opportunity to learn about preparation and logistics. 9:37 am: The projector splashes images on the whiteboard as Price launches into a presentation on differentiating native/nonnative/invasive plant species (of 6,000 plants species in California, 1,800 are nonnative but only 200 are classified as invasive). Price breaks the group into two teams, and distributes a series of plant photos. After verbally describing a plant, he asks each team in turn to identify the plant, explain why it is invasive, and show on a map its place of origin. “I can tolerate it,” she confides to this reporter later. 10:07 am: After reviewing the day’s agenda, it’s time to go. The captains for the day, Hovhanes (a senior at Galileo Academy of Science and Technology) and Dylan (a sophomore at Lincoln High), organize the team in pulling tools from the basement and loading up the two green vans. Among the implements on the list: 10 weed wrenches. “Oh, cool!” says Colton, a junior at Galileo. Colton’s no stranger to heavy-duty weed pulling. He started as a Saturday volunteer at Lands End with the Conservancy’s Park Stewardship program because service hours were a school requirement and the site was close to his home. But the expediency of the situation soon gave way to a genuine appreciation for the work. Growing up in the area, he remembers when the area was “full of weeds and nothingness”—and now relishes his role in changing the landscape. “Just being the change I want to see at Lands End,” Colton explains. 10:42 am: The vans come to the end of Donohue Street in Sausalito. The gate arm is pushed open and RYC roll onto Alta Avenue, a dirt road pitted with craters. As Bill Withers’ “Lean On Me” comes over the sound system, Megan tells the youth in her van the story of Marincello—and the grassroots effort that quashed the nascent housing development in the Marin Headlands during the 1960s. As the vans cross from privately held property to the lands of the Golden Gate National Parks, Megan also tells the students that funding for controlling invasives comes from the desire to reduce the potential fire hazard. The ecological benefits—she notes—are a wonderful bonus. 10:54 am: At the intersection of the Alta Trail and the Orchard Fire Road, the RYC unload the vans under a bright sun. With the frill of fog around the hills dissipated, the crew members face the prospect of a sweaty workout. They each grab a 15-pound weed wrench and a neatly folded Tyvek coverall suit—a preventive measure against poison oak. “Is this one size fits all?” asks Abby, a junior at Convent of the Sacred Heart. “It’s one size fits none,” Kara quips. “Let’s go!” Price says, and the 13 RYC participants begin their trek to the work site, up a steep hill, hefting weed wrenches taller than some of them.